How does a kayaker travel with GoOpti? Where do you put the boat? Haha, the boat and all the equipment are loaded in our coach’s van, while we kayakers go with GoOpti to the airport and take the plane to our destination. At least this happens when we go to the races. It’s another thing when we go on training camps. We usually take a van and drive there together and this can be very tiring. When we last traveled to Pau in France, we drove for 16 hours. Horrible. As a professional athlete, you've certainly seen quite a lot of the world. Did you fall in love with any piece of it? Yes, Tignes, France. It's heaven on earth. I discovered it when we went to a training camp and since then, I travel there with my girlfriend every summer. We are both completely in love with this place, because it has everything a person could possibly wish for; the glacier allows skiing 365 days a year with more than 150km of pistes, there are numerous mountain bike trails in the area, the lake offers various water sports, etc … There I also recorded a video of how I did three different sports in only one day; first I skied, then I rowed, and finally I cycled. I love Slovenia, but if I had to move somewhere, I would move there. How do the trainings abroad look like? Can a sportsman find the time to convert into a tourist? It depends on what sort of person you are. Most guys follow the principle hotel, computer, television, training, eat, sleep ... I always choose places where you can also see something, have new experiences. Trainings are of course the most important as they take place 6 days a week, three times a day, which looks something like this: in the morning from 8 a.m. to 9:30 a.m. we train on water, then we have an hour and a half of free time, then an hour and a half of fitness, followed by lunch, an hour and a half of rest, and around 3 p.m., again, training on water. You can play tourist on Wednesday, because we have trainings only in the morning, and on Sunday when we have a whole day off. When we were last in Empuriabrava, Spain, near Barcelona, I took advantage of every free moment to visit all the most interesting sites. Is there a place for trainings that you would rather avoid? Yesss, this is Al Ain near Dubai. A sheikh made an artificial kayaking trail in the middle of the desert. 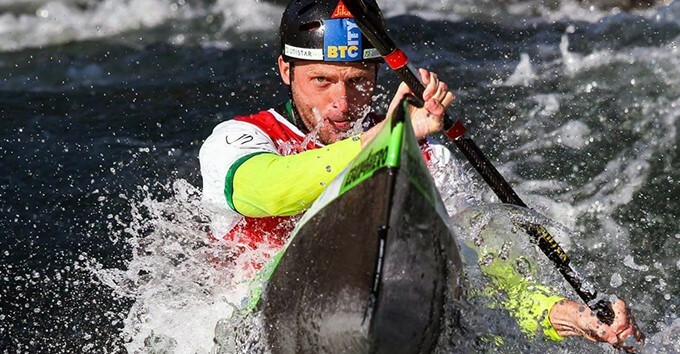 Our slalom kayakers usually go there as well as other European athletes, but I wouldn’t go even if they paid me, because I would go crazy there! Except for the training, I wouldn’t have anything else to do there, because it is in the middle of nothing. (laughter) Yes, I have some of Batman’s traits, for sure. Even the results I’ve achieved indicate that my sport’s performance is improving and that I continue to grow as an athlete. I don’t know, maybe I have good predispositions for such a sport, but I’ve noticed that I achieve the same or better results with less input than other athletes in this discipline. But I think that it also depends heavily on the psychological readiness. You can be a top sportsman, you can be 100% physically ready and technically skilled, but if you are not 100% concentrated and focused during the competition, then everything is in vain. Psychological preparations are crucial. You only have one chance. * Nejc made a promotional video with his sponsor in which he represented James Bond, making his way from London to Venice on a motorcycle, bicycle and a boat. In the second video, he acted as Batman. And he was amazing in both roles! You can watch both videos HERE. Are you nervous before the race? Well, I've always had trouble with fear before the race. But that's good, because if I have it, then I know I’ll compete well. At some local competitions, where I have no fear, I notice that I give only 95%. But when I feel shaky and nervous, then I know I’m dealing with something really important, and only then that special moment happens when you fall into some kind of tunnel and you do not hear anything and you give 105% of yourself. When I can feel my body aching after the race, then I know that I really did my best. Sport is a long-distance journey, even though your discipline is sprint. :) How would you describe the path of a professional sportsman? I think that I have the best profession in the world. The path of a professional athlete is very taugh, as there is a lot of suffering (laughter). When you train in the winter, you suffer from frost, all your body hurts, and you often ask yourself why do I need to do that. Then comes the second part of the season, when the races begin, you train even more, you try to overcome your weaknesses, strengthening your physical and psychological form and experiencing severe adrenaline shocks in the races. However, when you come to the finish line and you see number 1 on the screen, you know that you are the best in the world and all your efforts are repaid. I think that this moment is the one that gives sense to the whole process. And it makes you feel accomplished.